Tom Clancy's Rainbow Six is a classic Clancy-style story where you lead an elite multinational task force battling international terrorism in highly realistic settings. Game play is organized around a series of missions in which you must plan and execute precise assaults on terrorist installations. As your mission advances, you uncover a larger and more sinister conspiracy, where the fate of the world hangs in the balance. And unlike other games, if you make a mistake, you're gone--because in the real world, one shot counts. Game is great. Challenging and fun. Two thumbs up for "Rainbow Six"!!! One of my favorite games of all time! The other reviews said it all... The graphics and playability are first rate, and the emphasis on good planning, encourages brains more than brawn. One thing not stressed enough in my opinion though, is the great multiplay to this excellent game. The fact that players don't respawn when killed encourages players to play toughtfully and work as a team with other players. Rainbow Six: What I think of it. Hasn't stood the test of time. When the game Rainbow Six came out, it was praised for being so revolutionary, realistic, and grondbreaking. Unfortunetly, not only were these claims exaggerated, but the game does not look nearly as good now as it did in 1997. Frankly, the graphics weren't terribly good in 1997 either. 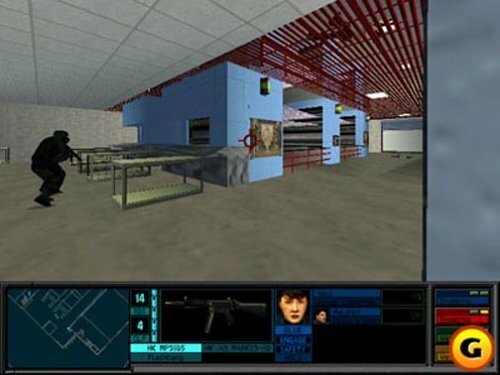 Games like Half-Life and Total Annihilation were coming out at the same time, and they still look great today. Moreover, there never was much semblance of a plot, and the AI (both friendly and enemy) is abyssmal. However, the game is still enjoyable, the levels still unique and well-designed, the weapons (although with the notable exception of the shotgun they all function essentially the same way) fun to use. The complication makes it an extraordinary game!!! You gotta get this game! thanks for reading play Rainbow 6 and remember "tanko down" and "delta go alpha go charlie go" "get down get down" you the commander of the best special ops of the team called Rainbow Six "escorting preshis cargo"